Welcome to the home of the LUCID Herbal Smoking Blend. We are proud of this flagship product, and couldn’t be more pleased with the kind words we've received regarding this completely synthetic-free product. We have a carefully-crafted line of herbal smoking blends, but LUCID Herbal Smoking Blend stands apart from the rest. Our manufacturer has put every bit of Research & Development into this product to come up with a revolutionary, tasty to smoke herbal blend that may give one a noticeably pleasant repose that lasts longer than expected. There is a lot of of hype about a lot of herbal smoking products, but we are so confident in our LUCID Blend, that we offer a 100% Return Guarantee within 30 days of purchase. 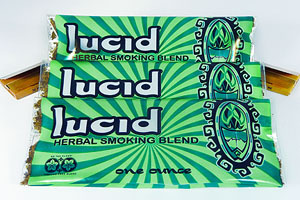 LUCID Herbal Smoking Blend comes packaged in a vinyl tobacco pouch complete with rolling papers, and is a fraction of the price of any competing herbal product of its kind. If you are a retailer interested in carrying our product, please feel free to contact one of our sales specialists for wholesale pricing and package deals, including marketing materials. We are: sales at sweetsmokeherbs dot com. Ingredients include a secret blend of herbs, oils, and resins, including Mugwort, Catmint, Woodruff , Betony, Blue Lotus, Blue Lily, Calamus, Galangal, Saffron, Neel Leaves, Brahmi, Indian Sarsapilla, with aromatics of Frankincense, Myrrh, Catnip, Passion Flower, and Licorice. Also blended with a dash of aromatics of Sage, Clove, Cinnamon, Wormwood and Blue Lotus.